إذا كنت تبحث عن فندق بموقع جيد في مايدينا، فقد وجدت ضالتك في Giants Table & Cottages . يمكن من هنا للضيوف الاستمتاع بسهولة الوصول إلى كل ما تقدمه هذه المدينة النابضة بالحياة. سوف يعشق النزلاء موقع هذا الفندق، فهو قريب من أهم المعالم السياحية في المدينة كمثل ‪Styx Valley‬ . يقدم Giants Table & Cottages خدمات لا غبار عليها وكل أشكال اللياقة وحسن الضيافة اللازمة لإسعاد ضيوفه. هذه بعض الخدمات الموجودة في هذا الفندق: مرافق مخصصة لذوي الاحتياجات الخاصة, تخزين الأمتعة, صف السيارات, خدمة الغرف, غرفة عائلية. تتضمن كل غرف النزلاء وسائل الراحة والتسلية المصممة خصيصاً لضمان الراحة القصوى للضيوف. كما أن مجموعة الخدمات الواسعة الموجودة في الفندق لضمان راحتك تترك لك الكثير من الخيارات لقضاء وقتك أثناء فترة إقامتك. يشكل Giants Table & Cottages بخدماته الراقية وموقعه الممتاز، قاعدة مثالية للاستمتاع بإقامتك في مايدينا. Cottages are obviously dated but have everything required for a short stay. The spa was an unexpected surprise and much appreciated. . Very friendly hosts accommodated my last minute change due to home flood/wind damage. Superb, quiet location. Lots of wildlife. its a really great place to stay in. the staff are very helpful and friendly. highly recommed it! Stayed a night but found the cottage far too cold even though it is only Autumn season (mid Apr). The portable heater is too weak, can only feel it when I am 10cm away. Luckily, the bed has warmer pad so at least I can snug in bed & try not to walk around. There is no restaurant around, best to bring along some food if possible, but owner can cook meals upon request. Toilet looks a little old but still acceptable. Overall still ok to stay if you need a mid-point accomodation from Cradle Mountain to Huonville. Great staff, great food, great location. We stayed two nights at the Giants Table and Cottages and thoroughly enjoyed our stay. Very roomy and comfortable cottages, yummy home-cooked food at the restaurant on site, welcoming and friendly staff and beautiful natural surrounds with lovely animals roaming around. There is even opportunity to spot the resident platypus in the ponds. We highly recommend the Giants Table and Cottages. Lindy is very friendly! She personally cooks dinner for everyone staying the night and is very understanding. 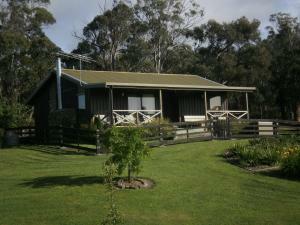 Each cottage is self-contained with bathroom, kitchen and living area with flat stream TV, etc, and they are all HUGE. The best part is that there are platytus in some of the ponds on the property. Another thing is that it is also about 10 mins away from mountain field national park so very convenient option for a stay here. Pleasant. It would have been more convenient to have a non vegan meal onsite but the pub just up the road made for a worthwhile substitute.